Iran (ایران) yε oman. Teheran yε kro titiriw a ewo Iran. Omid satellite. Iran is the 9th country to put a domestically-built satellite into orbit and the sixth to send animals in space. 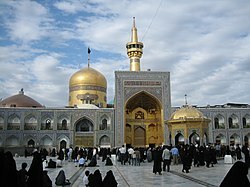 Imam Reza shrine in Mashhad, one of the most important religious places in Iran.